Group: Clays and also The Montmorillonite/Smectite Group. Uses: an ornamental and heat, acid and electrically-resistant stone (soapstone) used as counter tops, electrical switchboards, carvings, etc, used as an ingredient in paints, rubber, roofing materials, ceramics and insecticides. Most commonly known as the primary ingredient in talcum powder. Talc is an important industrial mineral. Its resistance to heat, electricity and acids make it an ideal surface for lab counter tops and electrical switchboards. It is also an important filler material for paints, rubber and insecticides. Even with all these uses, most people only know talc as the primary ingredient in talcum powder. Mineral specimens are not very common as it does not form very large crystals. 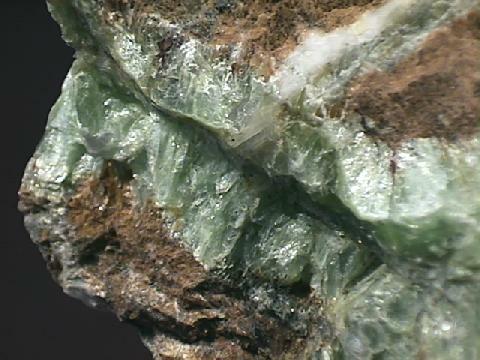 However, it often replaces other minerals on an atom by atom basis and forms what are called pseudomorphs (false shape). The talc takes the form of the mineral it replaces. A specimen of what looks like milky quartz is quite a suprise when it not only has a soapy feel but can be scratched by a fingernail. Color is green, gray and white to almost silver. Crystal Habits: never in large individual crystals, but if found are flattened tabular crystals with a hexagonal cross-section, usually talc is found in compact or lamellar masses. Forms pseudomorphs (false shape) of other crystals such as quartz, pyroxenes, olivine and amphiboles. Other Characteristics: cleavage flakes are slightly flexible but not elastic and talc has a soapy feel to the touch. Associated Minerals include serpentine, dolomite, magnesite, quartz, pyroxenes, olivine, biotite and amphiboles. Notable Occurances: include many mines up and down the Appalachian Mountains and in California and Texas, USA; Germany; Florence, Italy; Tyrol, Austria; Transvaal, South Africa and Shetland, Scotland. Best Field Indicators softness, color, soapy feel, luster and cleavage.